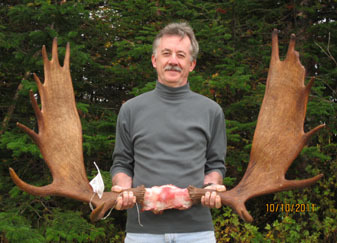 All our lodges are located in northern Newfoundland for moose hunts. We now have 1 hunting camp in area 45 and 1 camp in area 02. The camp in area 45 is called DJ's Pond. The camp in area 02 is called Jamie's Pond. We now operate 13 hunting lodges. Success rate is 90 - 95 % for moose and 98% for caribou. All our hunting camps are fly in. Our Caribou permits are in Area 69. Meat is pack boarded out at all of our camps. We can accommodate people with some disabilities. We will do the best we can to make their hunt a success. Hunting is a challenge in most of our areas and good physical health is of benefit to you to hunt in most areas. The majority of our hunters go away happy and content. Our base camp is located at Raft Pond, near Hawkes Bay. This is where you will be picked up and delivered to one of our hunting camps. While your waiting to be picked up by our aircraft, you may want to take in some of the beautiful scenery surrounding the pond. Leander Lake located approx. 8 miles north of Five Island Pond. The land is not as mountainous as at Five Island. The vegetation is more open than in most areas of the peninsula. We have two J-5's to assist in getting the meat back to camp Leander Lake is located in area 03. E&G Lake approx. 20 miles northwest of Gregory Lake. This lake has the hardest walking surface. At this camp, the hunters do a lot of walking for there is a lot of open country. E&G Lake is located in Area 39. Belvy Pond 6 miles northeast of Martin lake. It is a much wooded area compared to all the other camps. Belvy Pond is located in area 39. Cameron Lake approx. 40 miles north of the Park boundary. The vegetation is very wet but still allows for good hunting. Cameron Lake is located in Area 39 and also has a boundary on area 03. Five Island Pond located at the north end of the Gros Morne National Park boundary. The boundary is less than 20 yards from the lake on one end. This is our most southerly camp. There is a great look-out from the top of the hill just behind the camp. You can see all the hunting area from this look-out. Five Island Pond is located in Area 03. Gregory Lake approx. 6 miles northeast of Belvy Pond. This lake is a mixture of shrub and wooded area. Gregory Lake is located in Area 39. Gregory Lake II located approx. 5 miles north of E&G Lake. This area has a fair amount of covering vegetation, with some rough terrain. Gregory Lake II is located in Area 39. Terry's Pond This pond is located in Area 03. Walking is fair to good. The hunting ground has a lot of open area and a fair amount of wooded area. It is on comparison with the other camps in Area 03. Gemic Lake This lake is located in area 03. Walking is fair to good. The hunting ground has a fair amount of wooded area. This camp is on comparison to the other camps in Area 03. DJ's Pond Located in area 45. This camp has a fair amount of open tundra. It has a river valley with large thick timber bordering on it. The walking in this area is fair to good. Mustard Pond Located in area 03. Jamie's Pond Located in area 02 this camp is close to the edge of the mountains. The terrain is fairly open and is surrounded by large outstanding hills. Walking is good, very little tuckamore, compared to the other hunting camps.